It's been less than a month since OS X Mavericks launched in the Mac App Store, but Apple is already asking developers to test an update to the desktop operating system. OS X 10.9.1 is available for registered developers to download and install, and all being well, the update should reach users in the near future. The release notes for OS X 10.9.1 ask users to focus on three particular areas - Mail, Graphics Drivers, and VoiceOver - and to report problems encountered back to Apple. However, as MacRumors notes, "there are no known issues with the release." Back in October, we heard that Apple was publishing nightly builds of OS X 10.9.1, along with OS X 10.10 (codename: "Syrah"), for its employees in Cupertino. Though the next major update for Apple's desktop OS isn't scheduled to reach users until next fall, the minor OS X 10.9.1 is indeed in the pipeline. OS X Mavericks, a free upgrade for Mac users, makes a number of changes to the OS X operating system. These include impressive battery life enhancements, the addition of Maps and iBooks apps, and more. 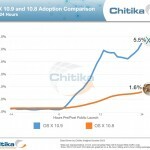 Chitika Insights recently reported hugely impressive OS X Mavericks adoption, and this is likely due to the price and compatibility of the software: Apple was careful to ensure that all Macs capable of running OS X Mountain Lion would be able to run Mavericks. Developers can download OS X Mavericks 10.9.1 through Apple's Developer website. See also: United Airlines App Takes Off With iPad Support, iOS 7 Design And New Features, Check Out The First Teaser Trailer For Cut The Rope 2: Om Nom's Unexpected Adventure, and Apple Announces Dec. 21-27 Holiday Closing Dates For iTunes Connect This Year.